We caught some words with the latest signing to Silent Soundz to talk about how they hooked up, their forthcoming projects, artists they’re feeling and the ins and outs of gas masks. First up, please introduce yourselves and explain the name. Cataclysm: Peace! I go by the name of Cataclysm aka Mohammed Yahya. Cataclysm means change, and the only thing that remains constant is change. I decided to name myself Cataclysm because as a student of life, I’m constantly going through changes, whether they be political ideologies or spiritual paths. Braydz: I go by the name of Ironbraydz (Soulph8) aka Abdul Rahman, one half of Blind Alphabetz. Co-founder of G.M.A (Gas Mask Apostles. What’s hiding behind the masks all about? Cataclysm: I don’t particularly wear gas masks to hide my face. I’m just trying to show the world that there are layers to people. The identity of a person wearing a gas mask is remained hidden ‘cause you don’t know what lies beneath. People are constantly stereotyped based on their appearance. Braydz: I don’t wear a mask to make people curious to see my features. I do it because it metaphorically represents a lot of things for me. EG. 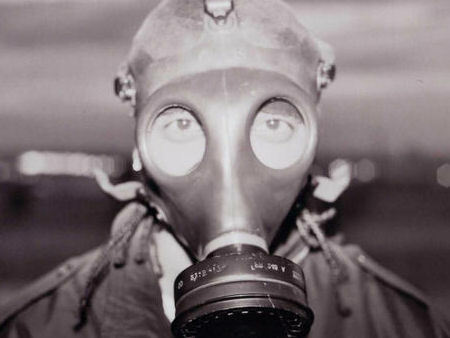 The gas mask is a piece of equipment used in times of war by soldiers to prevent them from inhaling poisonous fumes like Depleted Uranium (even though the gas mask doesn’t protect them against its potency) but other nerve gasses which are less harmful. If you look at the front of a gas mask, it has an attachment which acts as an air filter to protect the lungs. I believe a lot of us must become the gas mask, in order to filter the truth from false that is constantly imposed on us by the media and other sources (Bush & Blair). How did you guys meet and then decide to become a hiphop act? Braydz: My brother and I met in college about six years ago. We lost contact until I got involved in another group. One of the members knew Cataclysm and asked him to join the fam’. We then kicked it as a group for another year and a half until we both realised everyone didn’t share the same passion and goals. Not long after that we became Blind Alphabetz. Ma sha Allah. May Allah be pleased. Who’s your biggest influences and favourite rapping duo of all time? Cataclysm: Life’s experiences, the prophet mohammed. Peace be upon him. Malcolm X and every person that I’ve read about that put their life on the line in order to achieve their dream. As for my favourite rapping duo, I have a few. Dead Prez, Fat Joe and Big Pun, Raekwon and Ghostface. Braydz: Allah, Prophet Mohammed. Peace be with him. My father. May Allah have mercy on his soul, and my daughter Naami. There are many more but these are my main influences to becoming a better person and more ambitious with life and its goals. 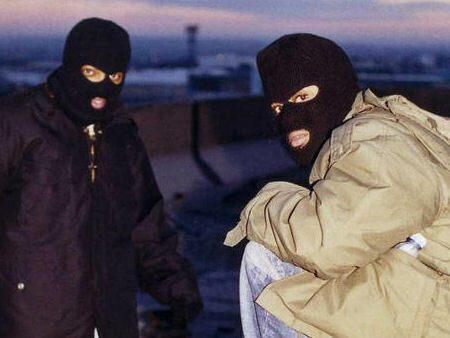 I can’t say who my all time favourite duo is but my top five has got to be Ghost and Rae’, Dead Prez, Cella Dwellas, Outkast and Organised Konfusion. May Allah bless them. Describe your sound to those that don’t know. Cataclysm: I think that is quite hard because as we grow musically our sound becomes more diverse. Braydz: Listen to the music and judge for yourself. The only way I would feel like describing my music is if I’m hustling it to a stranger on road, but I would be honest with my opinion. What projects have you released so far and what’s in the pipeline? Braydz: Just a street EP, but we’ll shortly be releasing a mixtape that comes with a DVD exclusive of our video (G.M.A) directed by High 8 Media. At the same time we’re having a single release with Silent Soundz called ‘African Rhythms’ which will also be an enhanced CD with the G.M.A video. What can we look forward to on the album? Braydz: Blind Alphabetz doesn’t have an album, not until we are satisfied with the growth of our own market which we feel is a realistic aim for achievement. It doesn’t have to be in the un-united kingdom either. No offence. Who’s been producing for you and who’d you like to link with? Braydz: Chemo, Averice, Fybes (Optic Designs), Jay-O (Los Sol Ent), Baby J, Urban Monk, soon to be Beat Butcha, Deep Rooted and my very own J dilla (R.I.P) who goes by the name of Jnr SAS, Kaan from Ammo. Oh yeah, and Ironchrome Pro. As u can see, we don’t like any producer in the game that’s on fire right now. Hahahaha. If I forgot anyone… sorry! I feel right now I would like to work with producers like Massive Attack, Portishead, Afex Twin, Radiohead, 9th Wonder, Rza, Organized Noize. How did Silent Soundz find you and sign you up to their label? Bradyz: It’s all thanks to Deep Rooted who had a good friend called Jimmy who was working with Silent at the time. They were working on the Sickness mixtape and I managed to get a Blind Alphabetz track on there, ‘Ancestors’. After that, Jimmy and I were cool so one day he sent me a text asking if I myself would be interested in doing a solo mixtape for Silent. I then holla’d back asking if Blind Alpha’ could do it, after consulting my partner in rhyme. They agreed, so here we are. Do you write as one or deal with your own verses and add them together? Braydz: We write as one when it comes to certain tracks that have us going back to back but other than that, we discuss the concept and come back with our thoughts. Where do you reside in and what UK acts are you feeling? Cataclysm: At the moment I reside in North West London, but I have also lived in South East and West London. As for domestic acts; Phalanx Heresy, Stylah, Lowkey, Reveal, Klashnekkoff, Kayza, Elite Team, Masikah, Poetic Pilgrimage, Best Kept Secret, Mecca 2 Medina, Remedy For The Poisoned, 9kontra, Hostile, Moorish Delta 7, Ty, Mr. Drastick, Smiler. Braydz: North West since I was seven when I arrived from Africa. Too much to mention but off the top I’m gonna holla at my first fam’ Elite Team… I Love them so much like the little brothers I wish I had. Phalanx Heresy, Mr. Drastic. People should pay to see him perform. Poisonous Poets, Best Kept Secret, Kyza, my extended fam, Poetic Pilgrimage. Jean Grey best watch out. Moorish Delta 7. ‘Nuff love to my big bro Cipha. Jewels, Fallacy, my big bro’, my life mentor, my shoulder to lean on. Short Man, Mr Scaramanga, David J The Pugilist, V dub, Mike GLC, our teacher in the hustle, D21, D Raw, Keez from Ammo, Kashmere, Pharaoh Biggs, Def 1, Mecca 2 Medina, Dawa Media, Masikah, Michael Ironside, even though we don’t speak anymore. Phi Life Cipha, Craze 24, Manage, Kope, Conflix. We all know I could go on but I’ll stop there. Sorry if I left anyone out. Are you out performing much and how do you enjoy the whole live side of things? Braydz: We were not on demand for performances but it’s picking up, and that’s because we love doing what we do on stage and I feel our audience can see that. We tend to just leave it to our natural instinct and close friendship and people like that. You’ve mentioned Bjork and Portishead as influences. Gonna get leftfield and create outside of hiphop? Braydz: Oh yes, if it’s in Allah’s will. What’s the websites people need to keep checking? Braydz: Myspace.com/blindalphabetz and Silentsoundz.com or just google the name. I’m sure you’ll find something interesting about us. Any messages you wanna kick out there to the readers? Cataclysm: Don’t expect the media to educate you because they wont. Nowadays they colonise countries through television programmes. No need for armies, no more, so educate yourself, and share that knowledge. No one knows everything but everyone knows something. May Allah bless us all and imbed his peace and love into all of our hearts. Alhamdulilaah this interview was good…. Theses bruddas deserve to be where they at in the cypha and then some…for the simple fact that they stand for what we all need to be standing for under onemovement, one cause one direction…. Insha Allah they will keep movin towards bigger and better things in this life and the next…. these guys are my brothers but apart from that great mc’s ! These brothers ROCK and we should all support them as they are the future of Hip Hop in this country and the future is looking very bright. these guys are very hot and too inspirational emcees. I like the fact that they are letting you know what time it is.And they do not mix there words. nuff respect and keep shining that light. 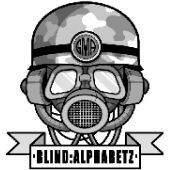 Blind Alpha are the Future!! Salaamz all. Mashallah these brotherz are mint! They have style, lyrics and kool tunez! Keep it up, I’m with you all the way.